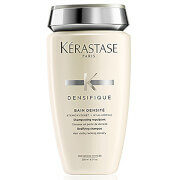 Build body and texture in fine hair with Kérastase Densifique Bain Densité, a rich and nourishing shampoo that combats lifelessness in locks. Powered by a potent blend of Hyaluronic Acid, Gluco-Peptide and Ceramides, the lightweight cleanser helps to strengthen each strand from root to tip, replenishing vital moisture and adding volume. Expect thicker, fortified and full-bodied results. 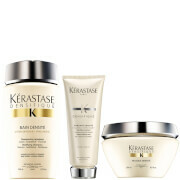 Suitable for fine, thin hair types. 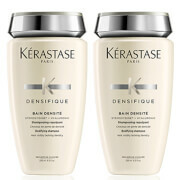 Aqua / Water, Sodium Laureth Sulfate, Disodium Cocoamphodiacetate, Glycol Distearate, Sodium Chloride, Sodium Laureth-8 Sulfate, Hexylene Glycol, Sodium Benzoate, Magnesium Laureth-8 Sulfate, Magnesium Laureth Sulfate, Sodium Oleth Sulfate, Hydroxypropyl Guar Hydroxypropyltrimonium Chloride, Alcohol Denat., Polyquaternium-30, Salicylic Acid, Carbomer, Magnesium Oleth Sulfate, Hexyl Cinnamal, Arginine, Glutamic Acid, Linalool, Citronellol, Serine, Alpha-Isomethyl Ionone, Hydroxypropyltrimonium Hydrolyzed Wheat Protein, Sodium Hyaluronate, 2-Oleamido-1,3-Octadecanediol, Safflower Glucoside, Geraniol, Sodium Hydroxide, Citric Acid, Parfum / Fragrance.